England manager Gareth Southgate confirmed the English FA will make an official complaint to UEFA after he stated racist abuse was directed at his players during their 5-1 defeat of Montenegro in Podgorica. In-form England responded in style after Montenegro took a shock early lead, as goals from Michael Keane, Ross Barkley (2), Harry Kane and Raheem Sterling eased Southgate's side to a second successive five-goal win at the start of their Euro 2020 qualifying campaign. Yet it was the suggestion that racist abuse had been directed at England players that was the major talking point after the final whistle, with Southgate confirming Tottenham defender Danny Rose was on the receiving end and suggestions Raheem Sterling was also singled out by the home fans. 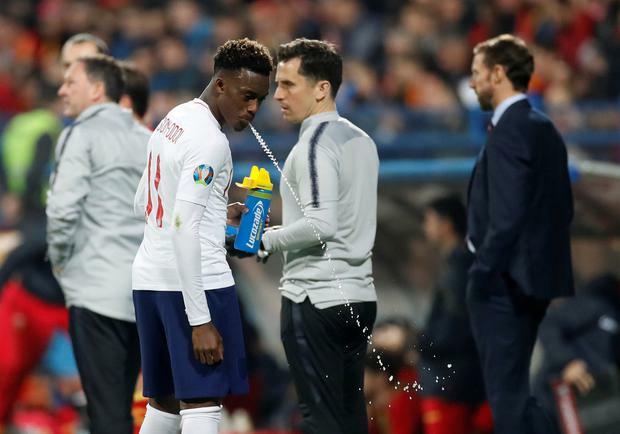 "I definitely heard abuse of Danny Rose when he got booked at the end of the game," confirmed Southgate. "There's no doubt in my mind that happened and we'll make sure that is reported officially. It's not acceptable. "I had a quick chat with Danny, but I've not had a chance to speak to Raheem. I know what I heard. We'll definitely deal with it in the right way and we have to make sure we support our players. I don't want to speculate yet, but I know what I heard." Former England striker Ian Wright predicted Montenegro will not be severely punished for the incident, as he suggested the European football's governing body have a track record of failing to stamp out racism in the game. "It will probably go to Uefa and they'll be fined a pittance and we'll get the same thing again here the next time or somewhere else in Europe," Wright told ITV Sport. "It's not going to stop them." England winger Sterling posted this defiant message (below) on Instagram after the game, with Chelsea youngster Callum Hudson-Odoi admitting he was shocked by the 'monkey chants' coming from the stands, as he urged action to be taken. "I don't think discrimination should be anywhere," Hudson-Odoi told BeIN Sports. "As I said, we're equal, we have to play a fair game and enjoy the moment but when you[re hearing stuff like that from the fans it's not right, it's unacceptable and hopefully UEFA deal with it properly because when I went over there and heard it, they were saying monkey stuff. "We just have to keep our heads and a strong mentality and obviously, hopefully, Rosey is okay as well and if anything we will have a chat and discuss what happened. He's got a strong mentality, he's a strong guy. "It's not right at all. I was enjoying the game as well and to hear stuff like that is never right but you've got to have a strong mentality and we're still delighted for the win." Southgate went on to praise his players for another convincing display, as they responded to the early setback of conceding the opening goal in fine fashion. "We talked all week about using the width and didn't turn down the option of using our wingers and they were incredibly productive," he added. "To go a goal behind, we showed some character and it was a good test. "Young Callum Hudson-Odoi was fantastic. You can see the talent and his application with us has been excellent. This is a great step forward for him and he has to progress and improve."